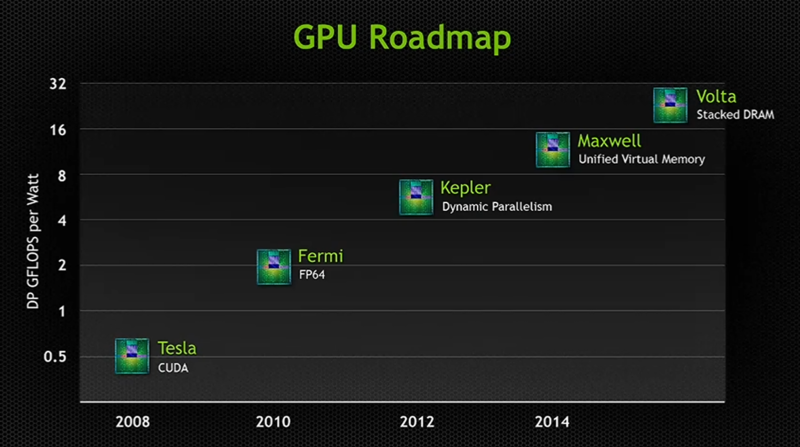 NVIDIA today at the GTC 2013 conference released a new GPU Roadmap which has unveiled their Next-Generation Maxwell and Volta GPUs planned for 2014 and 2016 respectively. NVIDIA Volta GPU would be the successor the Maxwell which arrives in 2014. The NVIDIA Volta GPU would feature stacked DRAM package on the GPU die along with an impressive 1 TB/s memory bandwidth which is beyond anything which current generation GPUs or even the 288 GB/s Titan has to offer! Current GPUs have been limited by memory bandwidth which affects their overall performance. Stacked DRAM on NVIDIA Volta GPUs would eliminate this flaw by stacking packages of DRAM on top of each other on the GPU die so that the GPU can directly communicate with them and this would lead to an 1 TB/s memory bandwidth on NVIDIA’s next generation GPUs. As far as Maxwell is concerned the GPU was announced back in 2011 and is sheduled for launch in 2014. The Maxwell GPU would be built on the TSMC 20nm fabrication process however it is not known what manufacturing process would the NVIDIA Volta GPU use. NVIDIA Maxwell would feature Unified Virtual memory which possibly means that the system memory could be shared across the GPU memory. In 2008, we introduced Tesla, our first GPU that incorporated CUDA. Two years later, we introduced Fermi. In 2012 we introduced Kepler. Next two GPUs from us: Maxwell is coming with unified virtual memory, which makes it possible for GPU operations to see the CPU memory and vice versa, so program-ability is easier. 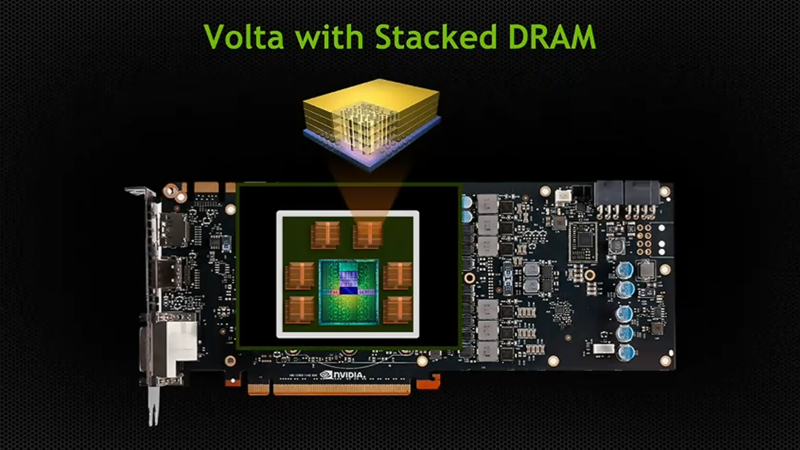 After that is Volta, which is even more energy efficient, which has a new technology called stacked DRAM.